Poly furniture material is High Density Polyethylene (HDPE), a recyclable plastic derived from post-consumer waste such as milk and detergent bottles. This material is cleaned in a decontamination process to a purity level of over 99% HDPE, then compounded into solid board stock material. The resulting product contains over 90% recycled post consumer waste by weight. Keeping plastic bottles reusable helps lower our landfill waste and there other benefits to creating outdoor furniture from poly? It is extremely durable and resistant to nearly anything Mother Nature throws its way. Poly plastic furniture can be left outside in the summer and winter without any adverse effects. The plastic is resistant to sun, rain, sleet, snow, wind, saltwater, chlorine and mildew. You can’t say that about furniture made from wood or metal; wood splinters and rots, while metal rusts. 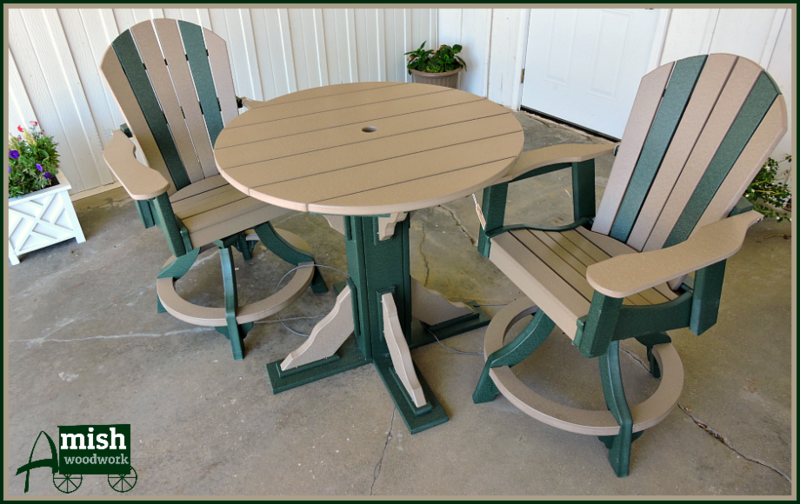 Poly furniture is low maintenance and easy to care for; it requires no special coatings, sanding or staining. It does not require hazardous chemical treatments to maintain its durability. Poly only needs to be cleaned with some good, old-fashioned soap and water. It is resistant to corrosive substances, oil and fuels, insects, and salt sprays; since plastic does not absorb moisture, furniture made from poly will not rot, splinter, or crack. Poly material combined with quality construction results in a product that will last a lifetime. Poly is available in a large variety of colors, such as Blue, Pink, Brown, Red, Turquoise, Orange, Tropical Lime Green, Dove Gray, Cherry wood, Cedar, Green, Black, Weatherwood, Yellow, Patriot Blue, Gray, Purple & White. So you are sure to find something that suits your personality and taste. 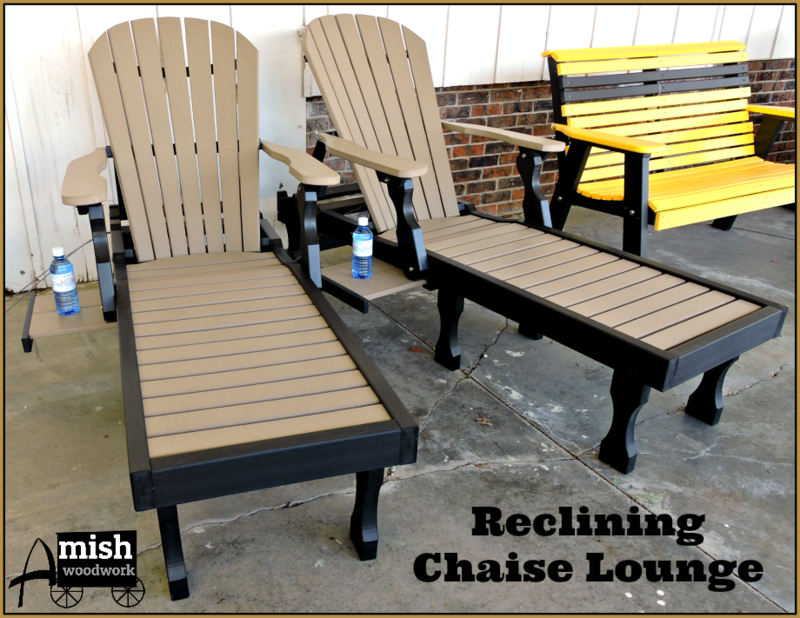 Another great characteristic of poly-lumber furniture is that it is uv resistant reducing fade. 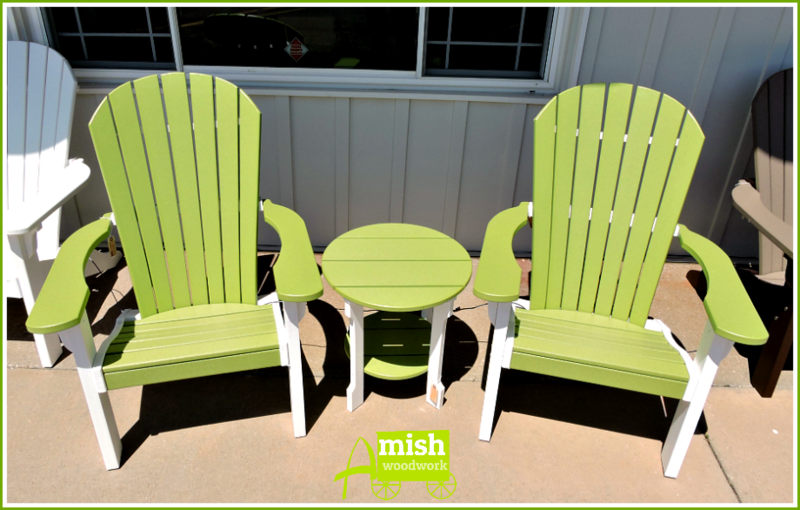 Poly chairs are heavier in construction and weight which helps them to stay in your yard and not your neighbors when a storm comes through.